Lingcod are super-aggressive eating machines that can’t resist the urge to attack. These ambush predators will attack and consume fish nearly their own size. Anglers may reel up two or three of these “bad boys” at once. One on the hook and others biting onto that fish! Lingcod fishing is both fast and furious, with many multiple hook ups. It’s a lot of work, but it is an absolute blast. They are actually greenling’s and are not true cods and can grow to weigh over 80 pounds (35 kg) Sometimes measuring 60 inches (150 cm) in length, they have large mouths with 18 razor-sharp teeth. Dark brown or copper blotches arranged in clusters dominate their variable colours. One of the Pacific Coast’s most prized saltwater species, lingcod feature an elongated body with a large head. In BC, lingcod will often attack other game fish and even other lingcod that have been hooked by anglers. 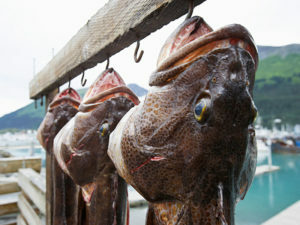 It is not uncommon to pull both a hooked rockfish and the attached lingcod all the way to the surface and into the net. Lingcod are found all the way up BC’s Pacific coastline from Victoria to Haida Gwaii. This species is attracted to rocky structures such as reefs, rock piles, rocky ledges, and underwater pinnacles common to BC’s Pacific coastline. Ask most offshore fishermen if they’ve caught lingcod, and they’ll probably tell you they did, but usually while trying to fish for halibut. Many of the popular halibut grounds are large underwater humps or ledges near the edge of the Continental Shelf. These rocky areas will host plenty of large lingcod. Typically, any rocky area has the potential to host a healthy population of lingcod, especially if it’s in an area that sees heavy tidal currents. In protected waters, such as BC’s Inside Passage, many anglers target lingcod in relatively shallow water. Lingcod can be caught in areas less than 25 feet deep. Juvenile lingcod can be found in great numbers around Kelp Beds, but larger more mature lingcod lead a more territorial life. Lingcod will rest on the rocky bottom as if they are lifeless, their mottled brown and green skin camouflaging them with their surroundings. As an unsuspecting baitfish swims by, the lingcod bursts to life, thrusts towards its prey and engulfs it. Lingcod will grab a lure or bait with extreme voracity. Metal lures are very effective for lingcod. While more expensive than fishing soft plastics, they can be the top producer. Metal jigs are slender and dense, therefore they sink quickly and get down to the fish. Select the proper size based on the depth fished. A one-ounce Pline Lazer Minnow metal jig is enough to catch fish around a Kelp bed, but a 24 ounce Norwegian Cod Jig might be what is needed offshore. Fishing for lingcod with soft plastics is extremely popular and extremely productive. Single-tail and double-tail plastic grubs in 4″ and 6″ are the most common lure to find in any lingcod angler’s tackle box. Swim-baits are also extremely popular. Purchase swimbaits that are weightless so that you can select the appropriately weighted jig-head. Handle the weight of your lure or set-up. Handle the size of the lingcod you are targeting. Conventional level-wind fishing reels are great for most saltwater fishing applications, including lingcod fishing. Spinning reels will work fine but usually lack the line capacity that a conventional reel offers. When fishing in extremely deep water of the Pacific Ocean’s offshore reefs, a sturdy 5’6″ halibut rod will handle the heaviest of weights and the largest lingcod you can dream up. When fishing inshore areas, a lighter rod will suffice. Many fishing rod manufacturers are producing ultra-light jigging rods that will handle large weights but lack the clunky heavy feel of a traditional halibut rod. Braided fishing line works well for any bottom fishes such as halibut or lingcod. Braided lines have many advantages to monofilament lines. Braided lines are ultra-thin. A line with 80# strength has the same diameter as 20# monofilament. The thinner lines will cut the current better, allowing you to use lighter weights to reach greater depths. These lines also have zero stretch and extremely high sensitivity. Regardless of the depth, you will know when you get bite. While a braided line has many advantages, it has very poor abrasion resistance. Lingcod are armed with very sharp teeth, so a heavy durable leader is important. Some folks use wire leader, but a thicker 40#-60# monofilament leader is much easier to work with. One preferred method is to drift with natural bait. A simple set-up includes a mooching sinker with a heavy leader and double hook using whole Herring. Drifting a whole Herring will allow the angler to cover ground while enticing any lingcod along the way. If you like a more active fishing style, thread a soft plastic lure on a jig-head, drop them to the bottom and “jig” them as you would a metal jig. To jig: lift the rod tip in a popping motion, and allow the jig to flutter downwards as you lower your rod tip. Like all of BC’s cold water fish, they are very healthy, high in Omega 3s and a great tasting favourite of West Coast chefs. They have a beautiful white, flaky flesh but some smaller lingcod caught close to the shore, will have a bluish-green tinge. Although it doesn’t look appetizing, this fish will cook up just as white as any lingcod. In the Pacific Northwest, Lingcod is often served in fish n’ chip restaurants, although getting fresh lingcod throughout the year can be challenging. If you are new to lingcod fishing or if you don’t want the expense of buying lures and equipment, charter a Silver Streak Aluminum boat! Select a fishing charter boat that is well-equipped and skilled in the trade of lingcod catching. Many charters have knowledgeable captains who are Coast Guard licensed and boats that are regularly inspected to ensure you have a safe, and comfortable fishing trip. BC’s waters are still full of big fish and it is worth going the extra mile and spending the extra time to catch quality fish. Different fish require different tackle and techniques. Look for a charter that will supply all the equipment and instructions to enable their customers to hook up and land the ferocious lingcod. Get in touch with us, we work with a number of first class charters and would be happy to put you in touch with one at a destination of your choice.